Dubai, UAE – Otani Tyres initiated an online campaign for the Truck Bus Radial segment that revolves around the key tips and recommendations for education purpose. The sole aim of the campaign is to help the target audience and the end-users maximize the benefit from the tires they use. A series of enlightening creatives are being used that talk about the key features and benefits of Otani TBR tyres such as, low rolling resistance, regrooving and retreading guidelines. Plus, the importance of wheel alignment, tire rotation, and problems arising from mismatch of duals is also highlighted for tyre usage and maintenance. A perfect blend of graphics and informative text makes it easier for the audience to understand the significance of the topics covered, and adopt them for better driving experience along with optimizing the benefits. 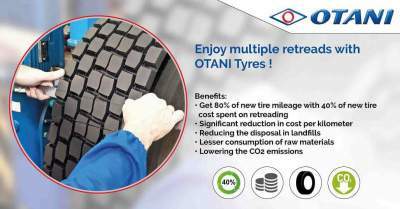 This campaign by Otani Tyres is a true gesture of being a responsible brand, yielding positive outcomes for the customers, environment, and the overall society.